An exciting insight into falconry past and present. In period costume or corporate image. Thrilling displays that will excite your audiences and give them a day to remember. Displays that transcend the language barrier and which are suitable for all ages. 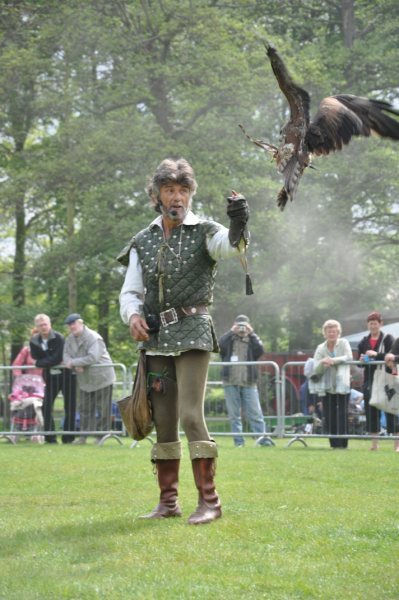 Falconry has all the essentials you would expect from a corporate day and a lot more! Your guests will have the chance to fly the beautiful Barn Owl and a cast (pair) of Harris Hawks. Watch the speed and agility of the falcons, including the fastest known creature on the planet, the Peregrine. Be involved! Take part with the Eagle Owl. In the event of bad weather, we may still be able to fly some of the birds inside and regale your guests with a light hearted, entertaining and informative talk. We can tailor our display to fit in with your day. Although the 50 minute display is highly recommended, for maximum impact, we can divide it up to accommodate different groups.